We finally seem to remember there are two title characters in this comic, and they both get a blast from the past. 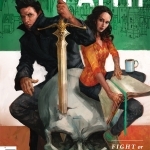 I keep waiting, and hoping, that Angel and Faith’s storylines will soon meet up. The wait continues. As we start off the issue, Angel’s having a showdown with some green monster that doesn’t take too kindly to his intrusion. But even with his vamped-up powers, it takes a woman’s intervention to save him and protect the bystanders in the process. That woman is none other than Amy Madison. You remember Amy, powerful witch gone bad. With her reappearance onto the scene, you know nothing good will come of it. And suspicions may turn out correct. When Angel goes off to the bar to forget about his really bad day, sure that Amy’s split town and will never return, he’s not about to give into Brandt’s attempts to get details out of him. Why bring up the past? Well, because the past has become present. Amy’s not gone, she’s come asking for a favor. She heard Angel brought Giles back from the dead and she wants to know how he did it. She’s got a hankering to bust Warren out of his current jar-encased situation. Like I said, bad things are coming. 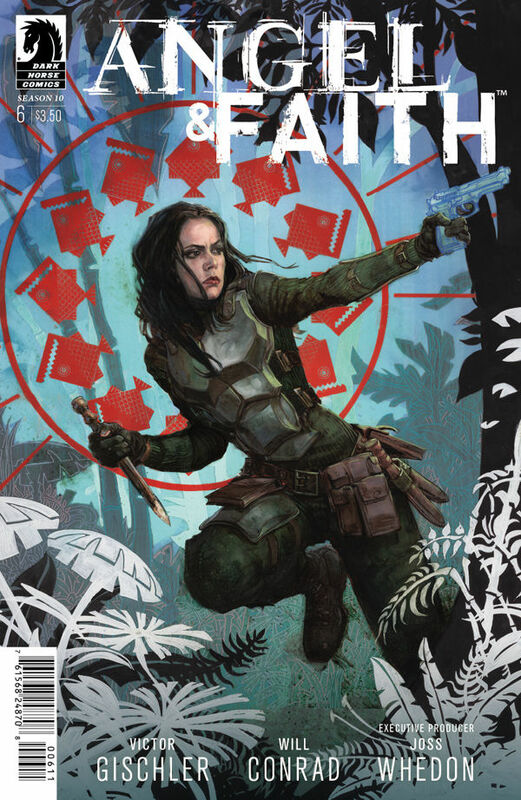 Over to Faith, she’s at least having a bit more adventure. 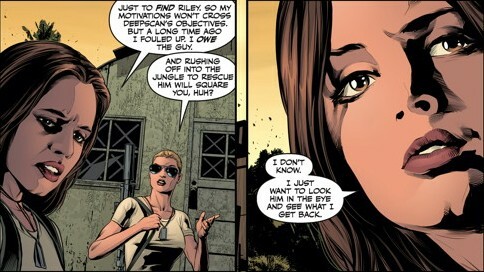 She and her fellow soldiers are on a military base in South America, ready to take on the mission of finding Riley and his wife, among others. Faith’s superior officer is suspicious of her, for good reason. She quit Deepscan and specifically came back for the gig of recovering Riley. Why is she so set on saving the man? And what dangerous things have he and his wife gotten up to, being associated with Walt Zane of Zane Pharmaceuticals? Will they manage to find any of them alive? Well, that depends. When Faith and the team go into the jungle, they’re attacked by natives. But these aren’t just regular warriors. Instead, they are vampires that can walk in the daylight. Faith’s team manages to kill most of them, and put the rest on the run, but not before their commanding officer is killed. Looks like the team needs a new leader, and Faith just got promoted to the job. Now if they could have success on their recovery mission, all will be well. But I’m sure there are many dangerous ups and downs bound to happen before that occurs.